Beef Shorthorn females met an exceptional demand from a packed ringside selling to a new Skipton centre breed record top of 6,500gns and £2,404 average for 52 heifers, with 97% clearance, at the breed society’s official autumn sale on Wednesday 8 November 2017. Sale leader at 6,500gns was Clipper X1152 of Upsall TI +19, SRI +16, a roan 20-month-old in calf heifer by the homebred Fortress of Upsall. 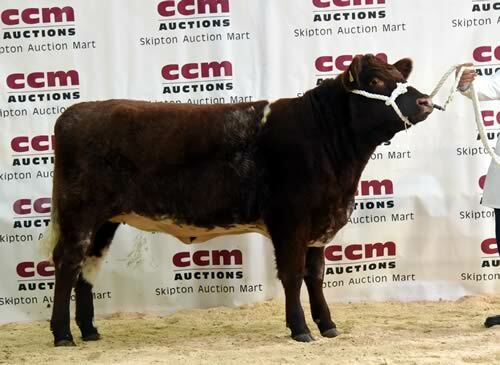 Bred and exhibited by the Hon G Turton, Thirsk, North Yorkshire she sold to J Sloane and J Hayton, Barrow in Furness, Cumbria. The Hon Turton cleared his 10 heifer entries to average £3,806, leading the trade with three more. A bid of 6,000gns from P Coates, Carlisle, Cumbria secured Tessa X1106 of Upsall TI +16, SRI +13, a roan two-year-old in calf heifer by Fortress. Two lots followed sharing a 5,000gns price tag and both went to Leazes Farm, Wolsingham, County Durham. First to go was Jilt X1097 of Upsall, a roan two-year-old in calf heifer by Dingo of Upsall, and the second, the day’s overall champion, Victoria X1170 of Upsall TI +23 SRI +19, a19 month old roan in calf Fortress daughter. Nonpareil X1142 of Upsall TI +11, SRI +9, a 20-month-old roan Glengoy Frigate daughter made 3,900gns to W and M Hebron, Bradford, West Yorkshire, whilst the 20-month-old red maiden, Gem X1136 of Upsall sold for 3,100gns to T Brown, Towcester, Northamptonshire. The reserve champion, Beautry Kooky Rose TI +18, SRI +14, a light roan 20-month-old by the homebred Beautry Hagrid from S Currie, Settle, North Yorkshire commanded a 4,500gns bid from RG Thompson, Whitby, North Yorkshire. Entries from H Horrell, Peterborough, Cambridgeshire were led at 4,100gns by Podehole Phantasy Jessamine TI +16, SRI +14, a light roan two-year-old by Podehole Fandago. The buyers were A and C Farms, Oakham, Leicestershire who secured a further three lots from the same breeder. They paid 3,500gns for Podehole Gypsy Kiva TI +9, SRI +8, a roan 21-month-old by the 10,500gns Millerston Fine Ideal, whilst at 3,000gns they took another Fine Ideal daughter, the red and little white two-year-old Podehole Rita Jaimee TI +19, SRI +19. A and C Farms’ final call of 2,900gns went to Podehole Genoa Kim TI +19, SRI +14, a roan 20-month-old by Podehole Fandango. Another Fine Ideal daughter, the 20-month-old roan Podehole Broadhooks Katie TI +21, SRI +14 made 2,800gns to W and M Hebron. Kimrina K Acy, a roan 22-month-old heifer by Podehole Falconer from C Ward, Whitby, North Yorkshire sold for 2,500gns to S Bladen, Sheffield, West Yorkshire. Averages: 4 cows in calf or with calves at foot £2,021.50; 30 maiden heifers £2,052.50; 22 in calf heifers £2,883.00.